At a time when commercial real estate is still bouncing back in the slow-growth economy of recent years, the medical sector has been a star patient. In the state’s three largest markets — Richmond, Northern Virginia and Hampton Roads — projects ranging from hospital expansions to medical offices and urgent-care centers have become key drivers for growth. One reason for the vitality of health-care facilities is the aging of the baby boomers. This large cohort of the state’s population — pegged at more than 3 million by the website Suburban Stats — is in need of more health-related services now, and that demand will only grow in the next couple of decades. In addition, as of February, the U.S. Department of Health and Human Services reported that more than 385,000 formerly uninsured Virginians now have access to medical care through the Affordable Care Act, another number that’s expected to rise. These demographic changes are like a shot in the arm for health-care real estate assets, which include hospitals and related facilities such as doctors’ offices, outpatient satellite clinics and assisted-living and rehabilitation facilities. “We’re bullish on medical properties,” says Louis Rogers, CEO of Capital Square Realty Advisors in Richmond. He explains that doctors not only make good tenants, they are in a recession-resistant business. People get sick in good economic times and bad. His company’s portfolio includes medical office buildings and drugstores nationwide, including four properties in the Richmond area. 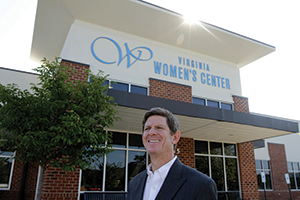 Last year, in a typical transaction, Capital Square bought the 20,000-square-foot Virginia Women’s Center in Mechanicsville from the doctors who had built it and then leased the property back to the OB-GYN practice. Rogers says many doctors prefer to invest in their practices rather than in property, yet some elect to be their own landlords. Richmond Nephrology, a practice of kidney specialists, paid $1.9 million for a vacant Centura College building on West Broad Street in Henrico County. After renovations, the practice plans to move into the 25,000-square-foot structure in December. It will occupy about 5,000 square feet and lease the rest. The Short Pump corridor in Henrico is seeing lots of medical office buildings — not as standalone developments but as part of mixed-use developments. For instance, the first of three buildings in the West Creek Medical Park at the Notch development near the Goochland County line opened in March. The 66,000-square-foot Medarva Stony Point Surgery center located in a 230-acre project that’s projected to have apartments, retail, other office buildings and a hotel when it is built out. The developer, the Henrico-based Lingerfelt Cos., has constructed nearly a million square feet of medical office buildings in the region during the past five years. Urgent-care centers also are emerging as a popular real estate asset, and they’re seeing a parallel increase in patient visits. In response, Chippenham and Johnston-Willis hospitals in Richmond, part of the Hospital Corp. of America (HCA) chain, recently closed a deal to build an $10 million emergency clinic on Hull Street Road in front of the Hancock Village shopping center in Chesterfield County. The 11,500-square-foot clinic, which should open in the first quarter of 2016, will have separate entrances for adult and pediatric patients, a CT scanner and a “telemedicine” link to the hospital to provide clinic patients immediate access to specialists. If they do need to come to the hospital, though, they now can be transported by helicopter. McManus says a record 100,000 patient visits to Chippenham and Johnston-Willis in 2014 led the hospital to add a helipad late last year. Next up, it hopes to expand its emergency room and add beds. In Northern Virginia, HCA also is on the move in areas where the population is surging. In southern Loudoun County, where thousands of houses are being built along Route 50, the health-care system will open the $147 million, 230,000-square-foot StoneSpring Hospital Center later this year. Also expected to open this year in that area is a $31 million 50,000-square-foot “healthplex” built by one of HCA’s rivals, Inova. The Ashburn facility, located seven miles from the StoneSpring Hospital, will include a 24-hour emergency room, diagnostic imaging center, labs and doctors’ offices, but no inpatient beds. Neil Rolfes, Inova’s associate vice president of strategic planning, says the Ashburn center is just one example of Inova’s burgeoning investment in NoVa. Another is its nearly complete $400 million women’s hospital tower at the Inova Fairfax Hospital in Fairfax County. In addition, fundraising continues for a $4.5 million modernization and expansion of Inova’s hospital at Lansdowne in northern Loudoun. Inova also is looking at three sites for new urgent-care centers in the region. 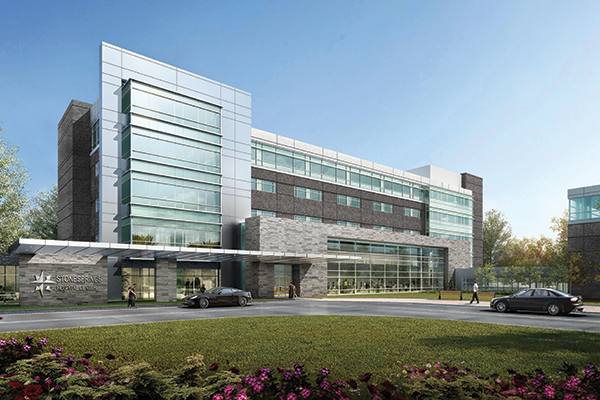 In Mount Vernon and Tysons, Inova is undertaking a joint venture with Sunrise Senior Living to develop assisted-living facilities, and it continues to expand its physician’s offices, with 22 locations for primary-care doctors and 50 for specialists. “The big trend is to grow medical groups by acquisitions and acquiring new doctors,” Rolfe says. Inova’s most ambitious undertaking, however, will be the development of the former ExxonMobil campus near its Inova Fairfax Hospital. The health system is in the preliminary stages of developing 1.2 million square feet at the 117-acre site, which will feature a cancer center, a personalized medicine research institute and IT space. Northern Virginia is seeing lots of growth in population. The 2010 Census found a 23 percent increase in the region’s population since the previous census, and projections are for a 15 percent increase for a population of nearly 3 million by 2020. The surge has helped fuel an equally ambitious agenda for another competitor to HCA and Inova, North Carolina-based Novant Health. Melissa L. Robson, president of Novant’s Northern Virginia Market, says her company is focused on operating “a network of care” in the region, and the rapidity and intensity of its expansion, particularly in Prince William County, is evidence of the seriousness of that intent. Last year, Novant opened a $100 million, 60-bed hospital in Haymarket along with a nearby ambulatory surgical center that it runs in partnership with physicians based in the community. It also opened a small cancer treatment facility three miles away in Gainesville. Less than 10 miles from its Haymarket Medical Center, Novant is in the midst of a $38 million renovation of the 50-year-old Prince William Medical Center in Manassas, which it bought in 2009. The “refresh and modernize” effort will feature a new façade to allow for separate corridors for patients and visitors, more conference rooms and a new chapel. Other expansions include an express-care clinic in Warrenton, which opened in September, staffed by a nurse practitioner, and an urgent-care facility to open in Bristow in early 2016. Like Inova, Novant is intent on acquiring medical groups. “Four years ago we didn’t have any medical groups,” Robson says. “Now we have 80 providers,” including the recently acquired Bull Run family medicine, just a 10-minute drive from Novant’s two Prince William hospitals. In the state’s other large population area, Hampton Roads, the medical sector of the real estate market had been dormant until recently. “For 10 years we didn’t see any real growth, but now new units are coming in,” says Robert M. Thornton, senior vice president of Cushman & Wakefield |Thalhimer. In June, Thornton’s company handled a $1.1 million land purchase in Yorktown for Smith/Packett Med-Com, which will build a 102-unit senior-living facility on the site.